In the elevator, I met a woman also heading to the MRI clinic. She was due for a second scan, and she was anxious: the noise, the tunnel, the claustrophobia. She even brought a friend for support. I’d experienced the exact opposite reaction. Weird as it might seem, I rather enjoyed the process: lying down, not moving, for 20 or so minutes. The noise level was not excessive (thanks to those earplugs, plus headphones to hear the technician’s voice). Mostly I appreciated the forced stillness. Perhaps that’s because I rarely sit still (not counting working on my computer or eating a meal). Any situation that forces me to be still is welcome. I like pre-flight time at the airport, reading a long-awaited novel and daydreaming with impunity. I like waiting rooms, where I have an excuse to rifle through glossy fashion magazines. I really like massage and haircuts, where I’m not only still but also pampered. In yoga, Savasana and restorative poses are all about stillness, physically and mentally. But, outside of class, how often do I do a long Savasana or a gentle class? Rarely. Okay, never. My occasional episodes of forced stillness do me well. Maybe they should be less occasional and more regular. Doing a restorative practice once a week might be just the ticket. Note: My MRI was normal, and my knee healed on its own. Go figure. 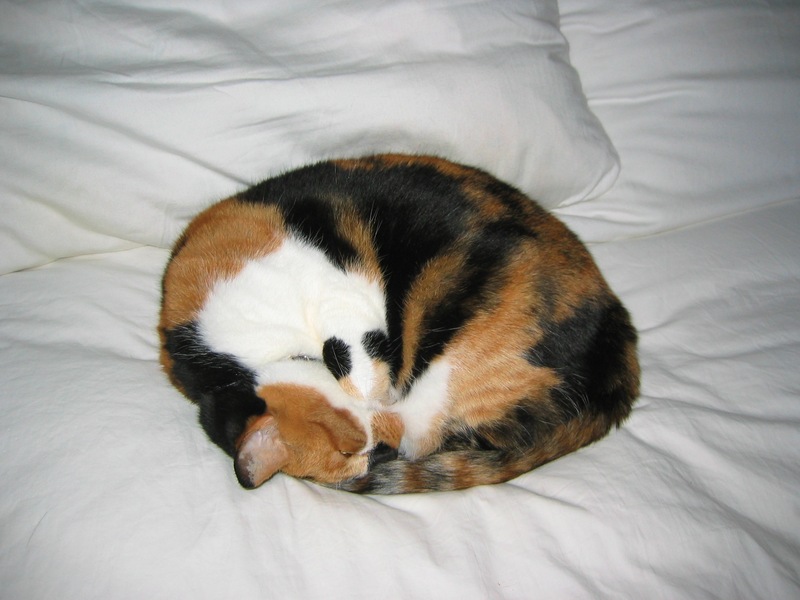 Image: Gingy, my late kitty who slept in perfect, symmetrical alignment. Love your post, thanks so much. Am addicted to stillness as well and don’t see how time flies during Savasana – 5 minutes, 25 minutes, I can never tell. Oh, I really look forward to forced stillness, I have to say. I feel like I’m buzzing so much of the time and a few moments when I have no choice but to sit still? Just wonderful! I am late to your blog and going back and reading them in order. I am enjoying them very much. This one touched me. A few years ago I went through chemo for a year. That sounds like a terrible thing, but those 3-4 hour blocks of time became precious afternoons to either be still or spend non-interrupted time with close friends. I don’t miss the chemo, but I do miss the forced stillness. Thanks for sharing. You reminded me again how we tend to be still only when absolutely necessary. For me, the forced stillness of travel (at airports, on airplanes) can be welcome, even if uncomfortable. I like shrinking my world and being a captive audience to a book or a movie. Previous Previous post: What have I got to be thankful for? Next Next post: What color is your parachute?